Temi Mwale is the Founder and Director of the London-based 4Front Project, an initiative that focuses on addressing the root causes of youth violence. During the 10th UNESCO Youth Forum in October 2017, she joined other youth working in the field of peacebuilding to discuss ways that UNESCO can better support young peacebuilders, particularly within the context of its work on Preventing Violent Extremism (PVE). Today, she explains the 4Front Project to us. “Young people have huge unmet needs when it comes to addressing the results of having witnessed violence at home and in the community. We know that long-term exposure to violence can lead to psychological problems, with 20% of people who experience trauma developing PTSD, yet austerity measures have resulted in enormous financial cuts and a substantial reduction in key services. As a result, young people are suffering with unaddressed mental health problems, unemployment, homelessness and substance abuse. 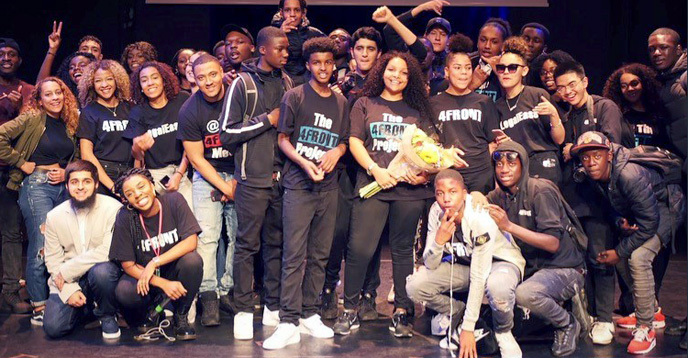 I set up the 4Front Project, which is a youth-led social enterprise on a mission to empower young people and communities to live free from violence, when I was 16 years old, after my friend was shot and killed on the streets of London. We believe that we must respond to violence with compassion not aggression, understand violence in context not in a vacuum, empower people to respond to violence, co-produce solutions to violence and most importantly that young people and communities must be at the forefront of solutions. We address violence by creating bespoke, holistic, youth-led interventions that are delivered in community, educational and criminal justice settings. Through our programmes, workshops and one-to-one mentoring, we empower young people to challenge the systemic conditions that generate violence and provide opportunities for them to positively impact society by amplifying their authentic voices and building resilience. We engage the young people who have been involved in or affected by violence, excluded from school and who are at risk of incarceration, in community healing initiatives. We reduce alienation by allowing young people to analyse the social issues that affect them through a legal lens and utilizing peer legal education as a mechanism for catalyzing change. The 10th UNESCO Youth Forum https://en.unesco.org/10th-unesco-youth-forum – “Rethinking youth engagement with UNESCO” – held at UNESCO Headquarters in Paris on 24 and 25 October 2017, brought together 60 young women and men from all over the world, all of whom are leading or co-shaping innovative social initiatives relating to a UNESCO field of competence. Now, more than ever, we are seeing young people leading change in their countries and communities all over the world and we want to bring these change-makers to the global discussion table. How can UNESCO better engage with youth – let’s ask them!